Just in time for the sunset, we arrive at our terrace top restaurant. The light was perfect, the city spread before us over seven hills, and the Bosporus sparkled and speckled with ships. As the sun dipped behind the pink clouds, Burcu and Behzat ordered meze for me to try. We had various types of hummus and babaganoush, shredded chicken, fresh feta, grilled liver, shrimp, octopus, and Turkish sausage. Unfortunately I can’t remember the names of all the meze but they were all delicious. This was accompanied by an endless supply of bread. I even got to try raki, a Turkish liqueur made from grapes and anise seeds. They mix it with water and ice and it’s very refreshing! 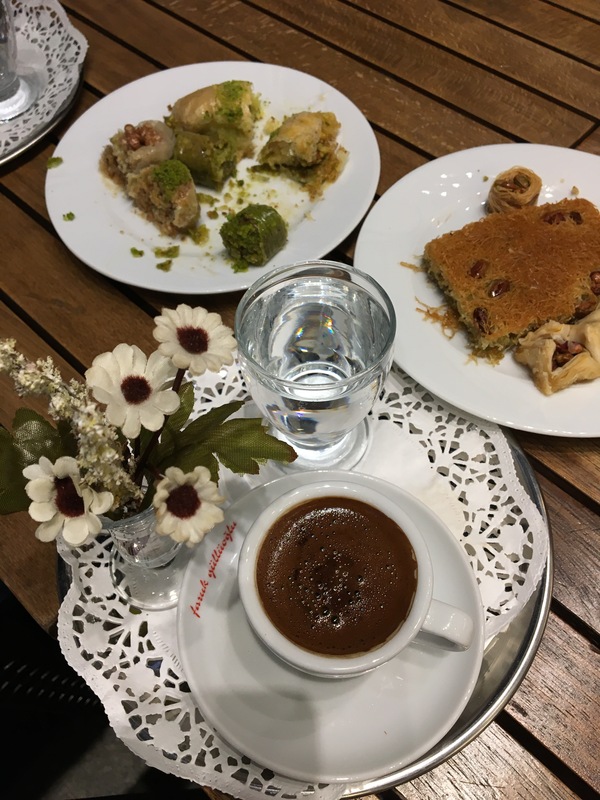 After dinner, I sampled at least four kinds of baklava and two other desserts. Elegantly served Turkish coffee helped me overcome my jet lag. Next we went to the Sultanahmet, the historic and spiritual center of Istanbul. 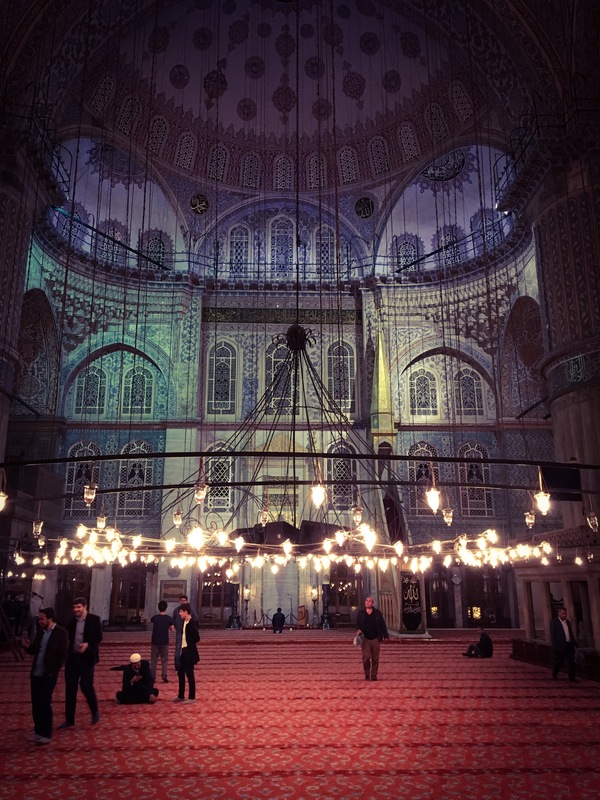 After waiting for people attending prayers to leave (it’s Ramadan), we entered the Blue Mosque. 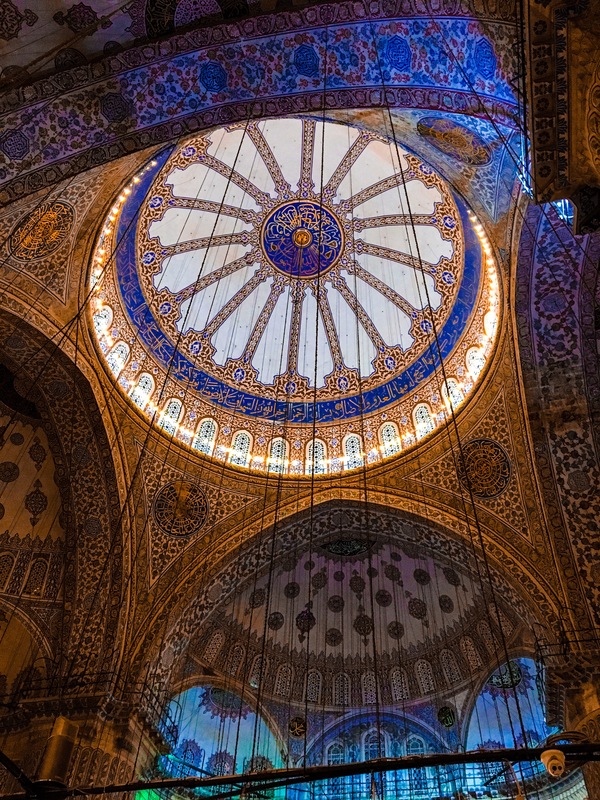 Built to mirror the Hagia Sophia, at least on the outside, the interior is covered with intricate and non-representational calligraphy, while the tiles contain 50 tulip patterns which have sacred meanings in Islam. The Hagia Sophia is quite a bit older, built in 537 AD. It was the Greek Orthodox basilica, then the imperial mosque, and now is a secular museum. 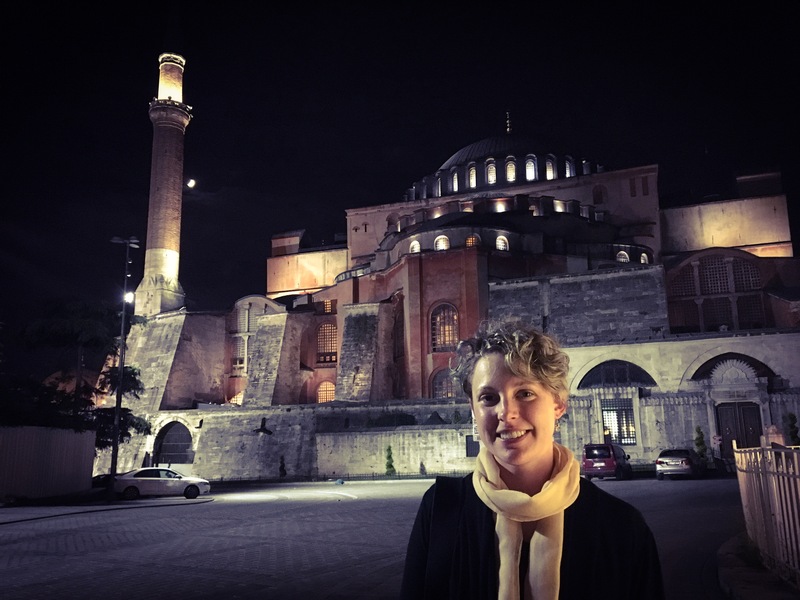 I studied the Hagia Sophia so much in art history that it felt like I was spotting a celebrity. The timing of my visit was outside of Museum hours, unfortunately, so I got a selfie with the well lit exterior. Some day I will be back to see the glorious inside with the Byzantine mosaics.